Water damage is one of the most common, and costly, misfortunes your home can suffer. In fact, homeowners and renters across the country lose billions of dollars because of it each year. But you’re not powerless. There are plenty of simple tactics you can use to stay snug and dry no matter what nature—or your pipes—throw at you. In this post we’ll show you the best ways to protect your home from water damage. Severe storms, floods and other extreme weather. Malfunctioning dishwashers or washing machines. Cracks in your foundation or walls. Roof damage, such as missing shingles or cracked flashing. Drainage problems on your property. Problems with your HVAC system. What Are the Signs of Water Damage? A strong musty smell in a room. Sagging in parts of your walls or ceiling. Stains or discolored patches on walls or ceilings. Water pooling in your yard after a storm. Mold growth (which can look like dark discoloration) on any surface. Now that you know the causes and signs of water damage, it’s time to learn how to prevent it. After all, your roof is constantly exposed to sunlight and precipitation. 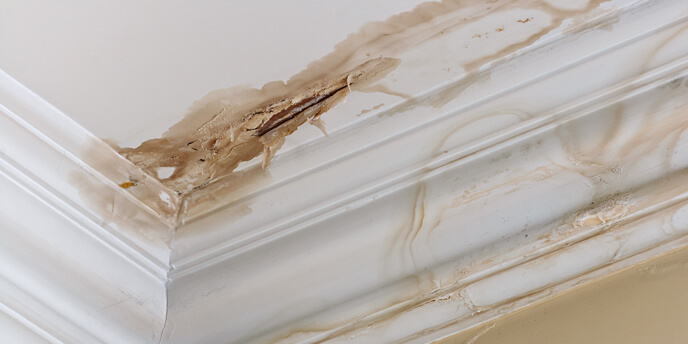 If it begins to deteriorate, roof leaks can develop without you noticing. But you can stay ahead of water damage by inspecting your roof regularly — especially after big storms. Use a pair of binoculars to look for any missing or broken shingles, cracked flashing or large debris on the roof. If you notice any of these warning signs, Clinton J. Ford, a certified general and roofing contractor in Gainesville, Florida with over 30 years of experience, says you should never try to handle repairs yourself. Ensuring good drainage is essential to protecting your home from water damage. Poor drainage weakens your foundation, leading to cracks, uneven settling and pathways for water to find its way inside. 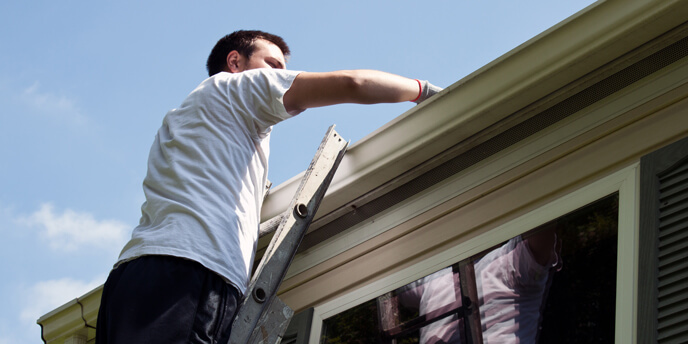 You should clean your gutters at least twice a year, once in the spring and once in the fall. 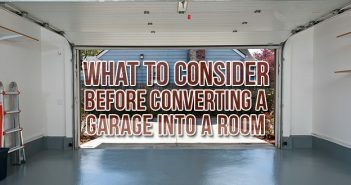 You should also throw in an extra cleaning after a big storm to remove wet leaves, branches and other debris that could be clogging up your gutters and downspouts. Begin cleaning near a downspout. Remove large debris (leaves, twigs, etc.) with a garden trowel or your hands (wear gloves!). Flush the gutters and downspouts with a garden hose. Gutter guards are a device used to protect your gutters from leaves and other debris. There are many different types of gutter guards, including reverse curve, mesh and nylon. Prices vary depending on what kind you get and how many feet of gutters you need to cover. Caulking and sealing your windows regularly is one of the easiest ways to protect your home from water damage. 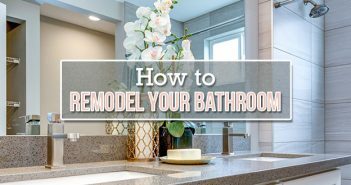 You can also apply caulking to bathtubs, ceiling fixtures, drains, faucets and other plumbing fixtures to keep water from seeping in where it doesn’t belong. Choose the right caulk: For a long-lasting seal, choose 100 percent silicon, which is permanently waterproof, flexible and shrink/crack-proof. 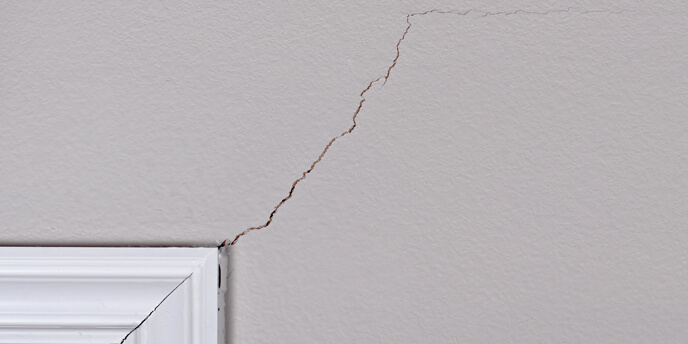 Avoid using acrylic caulk, which can shrink and crack over time, leading to water seepage. Clean the surface: Remove old caulk and loose particles with a caulk-removing tool. Prepare the tube and seal: Insert the tube of caulk into a caulking gun and seal around cracks. Squeeze with even, consistent pressure to control the amount of caulk applied. Smooth the seal: After applying the caulk to the desired areas, use your finger or a caulk-smoothing tool to even out the bead. 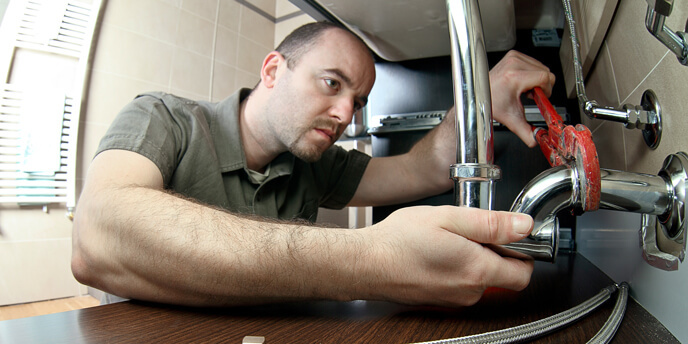 It’s a good idea to inspect all the pipes in your home at least once a year. Over time, pipes gradually corrode, rust, and decay, all of which can result in leaks. In severe cases, you could be facing a flood of water or raw sewage into your home, causing extensive—and expensive—damage. According to Ford a “failure to understand the required maintenance” often leads people to neglect their pipes. If you live in a cold climate, this could one day save you thousands of dollars and lots of hassle. By installing an emergency pressure release valve in your plumbing system, you’ll be able to quickly relieve the pressure caused by freezing pipes, thus preventing them from bursting. A sump pump is your first line of defense against basement flooding. They’re used to pump water that has accumulated in a sump basin away from a home to a municipal storm drain or dry well. Locate the exit pipe on the outside of your home where the sump pump directs water out of the basement. Inspect the pipe for damage and remove any clogs if necessary. Locate the sump pump in your basement and check that the electrical cord is still plugged into a functioning outlet. Remove the lid to the sump pump, if it has one, and clean out any debris. Pour approximately 5 gallons of water into the basin of your sump pump. Pour slowly until the pump turns on and begins to pump out water. Now that you know how to protect your home from water damage, all you’ll need to worry about during the next heavy rain is remembering your umbrella on the way out the door. Need more home maintenance tips? 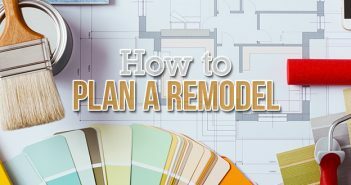 Check out the Home Improvement section of our blog. Ever dealt with water damage? How did you fix the problem? I really appreciate your advice to make sure that there is good drainage around a house to protect from water damage. I have a sister that is doing a lot of repairs on her house, but it has just gotten into the rainy season where we live. I will be sure to relay this info to her and tell her to make sure that her gutters are clear to make sure that there aren’t any complications in the repairs.